This entry was posted on Tuesday, September 6th, 2011 at 01:24 and is filed under Business, Economics, Politics, Sarah Palin. Sarah Palin Takes on the Crooks! One of the problems our nation faces at this moment of economic crisis is that all too frequently, the best answer to a problem is ignored, the best person for a job doesn’t get it, and the best path forward isn’t followed. This leads to a faulty conclusion among far too many Americans about the virtues of capitalism: They don’t see any. Lost in the shuffle of bureaucratic paperwork, and wrapped in a pile of red tape, and hidden from sight by nifty euphemisms, the American people are not suffering from too much capitalism, but as Governor Palin understands, too little of it unobstructed, and unadulterated by crony capitalism. Many people are confused about the difference, even unaware that the increasingly dominant system really isn’t capitalism at all. Few Americans have known real capitalism, because for generations, politicians have been stealing their economic and political rights. It’s time we clear up the meaning of all of this, and consider what is capitalism, as distinct from the shoddy representations of it we’re provided by the entrenched permanent political class inside the DC beltway. Sarah Palin understands why crony capitalism must die, but now in order to save this country, so must you. Capitalism is an economic system that relies upon individual choices and freedom, not merely in the economic sphere, but in all facets of life. To succeed, Capitalism requires that individual men and women are free to make choices on what to produce, when to produce it, how to produce it, and whether to produce it at all. It also requires the free choice of those who will purchase, whether goods or services, without the intervention of people and institutions who seek to rig the market to their advantage. The moment you begin rigging the market to support somebody’s idea of a preferred outcome, you begin to destroy Capitalism. Like any economic system, Capitalism relies on certain rules too. There must be a presumption of rights to one’s property and one’s wealth, and there must be stability in the rules. Fraud and theft must be punished, disputes must be resolved against an objective standard of law, and the security of the nation must be preserved in such a way to avoid intruding unnecessarily into the market or the freedoms of citizens. What must be happen in all cases is that those with the power to legislate, regulate, or interpret those rules may never be permitted to use those rules to exact their own subjectively defined preferential results. In the same way that actual, objective justice is displaced by subjective notions of justice, like social justice, racial justice, economic justice, and more recently, environmental justice, so too is real Capitalism displaced by the predations of its shoddy imitator: Crony capitalism. When you hear a social activist claim to pursue “social justice,” what they’re hoping to do without you having noticed is to substitute a fake, and completely contrary idea for what is actual justice. In our legend and lore, Lady Justice stands blind-folded, scales in one hand, and a sword at the ready in the other. She judges the matter based on an objective rule of law. What “social justice” or other modified forms offer is to set aside the objective form of justice in the name of the subjectively derived ends in question. One notion of social justice is that all people ought to have sufficient food to eat, but it requires that some people have food(or the money to buy it) stripped from them to feed others. Justice would weigh the matter and answer that the property rights of one individual do not exist at the discretion of others, but the notion of “Social justice” demands a scrapping of the objective standard. In much the same way, all of the other perversions of justice seek precisely the same end: To strip some people of their rights and liberties in order to give preferential treatment and wealth to others. These notions displace and destroy actual justice. For these same reasons, crony capitalism destroys the real thing. In a real capitalist system, the market and consumers would evaluate a product or company and decide whether to purchase it based on considerations that are entirely a matter of personal choice. If you have a large family, for instance, you might wish to purchase a larger vehicle, such as a min-van or an SUV. The only deterrents to this choice the market would impose is that these get poorer gas mileage and cost more to purchase and maintain. If your family necessity dictated it, however, you would purchase the vehicle you need and consider it as a cost of the family you’ve chosen to raise. If government steps in to make that choice more difficult, or to make it altogether impossible by regulating large vehicles out of existence, what you are seeing is one application of social engineering, and in most cases, also a healthy dose of crony capitalism. Somewhere, behind the scenes, somebody’s palms have been greased in one or more ways, from one or more sources, all aimed at deriving a particular outcome in the marketplace: Fewer mini-vans and SUVs. Environmental groups will seek such ends, but so too will manufacturers of smaller and lighter vehicles. In both cases, there will be some politician(s) somewhere deriving a benefit from the legislation, in one or more forms. One is in the direct cashing in through investments and the manipulation of the markets, and another is through contributions to election campaigns. For nearly every piece of legislation or regulation to come out of Washington, there is very likely to be one or more such stories on the back side that make clear that Capitalism is being discarded in favor of some particular corporation, group, or individual. This process dominates the legislative process, and it happens at all levels of government, but in no other place is it so rigorously practiced and thoroughly entrenched as in the federal establishment in Washington DC. Many people will wonder what kind of difference this issue really makes in their lives. The truth that is concealed beneath the surface is an ugly mess of corrupt politicians, entrenched interests, and insider trading and deal making that defies summation, not because it’s hard to demonstrate, but because the whole fabric of Washington politics is awash in it. It’s become the infinite web of lies and deceit that stands guard over an establishment preying upon the people it alleges to serve. Consider the health-care debate. How many pharmaceutical companies had a hand in crafting the legislation? In 1993, when Hillary Clinton was working the health-care issue, she was stopped in part by the fact that the pharmaceutical industry opposed her plans which ignored their property rights and the actual needs of the market. This time around, with the passage of the Affordable Care Act, commonly known as Obamacare, the industry was bought off by granting to them large giveaways and concessions. The politicians purchased silence this time. In exchange for their silence, the legislation was crafted to aid them and better insure their future, or so they were led to believe. Also in exchange will be the political contributions yet to come. You might think this is awful, but what institution has the ability to shut up large corporations, by some form of extortion or bribery? With legislative and regulatory powers that have exceeded all previous bounds, no business can survive an all-out assault by the US Federal Government. There isn’t a soul alive who can out-gun the US Government if Congress and/or the President decide to make you their target. It’s also true that nobody can make you richer, faster. All you need to do is set up a company to pursue some goal like green energy, and they will throw federal dollars your way in the form of both direct and indirect subsidies. A company can modify an existing product line to comply with the news standards, but all too frequently, without a political contribution, it will make no difference to the regulators. Direct subsidies will come in the form of grants and various tax loopholes, and indirect subsidies will come in the form of tax incentives to those who will buy the target product or service. That’s a pretty lucrative process if you can get in, and the politicians in Washington dispense your money in exchange for some cash in the contributions basket. If you think that’s not bad enough, ask yourself what interest government would have in creating standards for who can work in the computer networking field. Yes, even here, it’s a kickback to somebody. Any time you see a government at any level requiring permits, certifications, or licenses to work in a particular field, you would do well to ignore their stated motives and instead follow the money. If you want to control a thing, all you need to do is control the people who build, own, operate, and maintain it. In this case, it’s aimed at the people with the skill-set, and it will undoubtedly lead to a greater unionization of the field that will in turn lead to higher wages in the short run, but lower productivity in the longer run. So, who is paying whom? Once again, you will find that unions are behind this, having become a sort of corporate interest of their own, using the power of government to freeze out competitors, all on the basis that they will deliver loot and votes to politicians. Those of you who think Republicans are or have been immune to all of this need to examine the question more closely. One can find Republicans and Democrats using these same practices. Democrats pretend to be the friend of the working man, denying any such connections, and Republicans use the notion that they’re business-friendly. I’m business-friendly: I continue to reward companies that provide me the best products and services, in part by way of repeat business or word of mouth advertising on their behalf. What some who claim to be conservative capitalists have done is to actually climb into bed with corporations for kickbacks and contributions. That’s not “business-friendly,” but instead mere crony capitalism. When Sarah Palin criticizes crony capitalism, it’s because she has a long and well-established track record of opposing it while serving in offices from the Mayor of Wasilla all the way to the office of Governor. If you haven’t seen the movie, The Undefeated, it’s now out on Pay-Per-View and you can learn about her struggle against Alaska’s version of the same dirty practices. Sarah Palin understands that there’s no way to make deals with the devil without becoming his tool, whether you’re the corporation turning to Washington’s interest, or a politician serving a corporate interest. This is because crony capitalism seeks to avoid the normal rewards and punishments of the free market, and in the end, destroys real capitalism. What Sarah Palin offers is the opportunity to wipe this mess away, to clean up Washington, and to turn tables on the corruption within. One of her bold proposals this Saturday offers a glimpse of the ideas for which she will fight. We’ve all been taught about the American inventors, innovators and entrepreneurs who started with a better idea, and built empires of industry, providing jobs and wealth to the whole economy as a result. What few of us realize is that all of this can be negated by the corruption of crony capitalism. We’ve all seen the mom-and-pop stores die off, not for inefficiencies in all cases, but frequently because corporate giants have been legislated or regulated market power they hadn’t gained by right of their performance in the free market. Government shouldn’t be so business-friendly that it takes the side of one business or industry over another, but all too frequently, this is what happens when politicians sell their souls to the highest bidders in exchange for maintaining their power. Republican Independent, or Democrat, we all deserve better. Sarah Palin understands this, and it’s why she’s fighting to clean up this mess. She knows there can be no lasting virtue in capitalism unless we remove its corrupt imitator. You can bet all the crony capitalists inside the beltway understand that she knows it, too. You do excellent work, Mark, thanks for this contribution. Excellent article! And yes,she does know crony capitalism, and how to fight it. 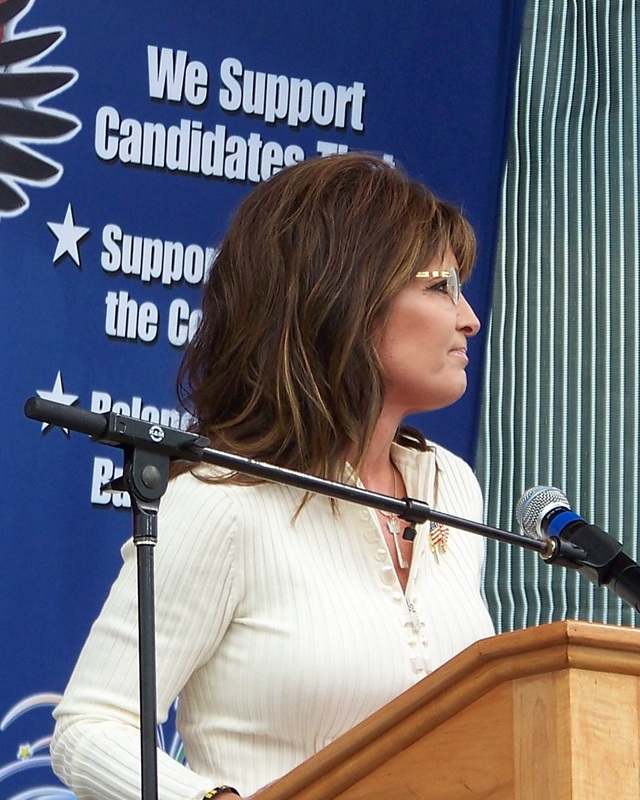 Sarah Palin will be an excellent President, should she choose to run. Mark, I got home yesterday and this morning I had my first look at "The Undefeated" on Pay Per View. As others have said, it is "totally awesome" Bannon did some outstanding job. It starts out a little slow or a little boring but from the first Mayors race on, it is riveting! I have to get some of my friends who don't know about her real story to see this film. PS: Nice meeting you in Iowa. O.p, it was great to meet you! That film is excellent because it corrects the record, or actually, fills in the giant blank space most people don't know about her because the media filled in lies and garbage instead. Thanks O.p.! Okay really? Are you fricken kidding me? "Social justice would give food to someone by taking it out of the hands of someone else" I don't know where you came up with such a crazy idea. Completely greedy and selfish. Why should Steve jobs or bill gates Keep all their food when they won't be able to finish it. Why throw it away when there are millions of hungry Americans without any food at all cuz greedy capitalism stripped them of their life. Do you call that fair? Would you call that social justice? No it is not. The problem with capitalism and the reason it doesn't work is the same as why communism doesn't work. It only looks good on paper but when apply it a society capitalism will destroy it. The problem with most republicans is they suffer from the "got mine" syndrome. They say I got mine now you go get yours. It may make sense to some ppl but the fact of the matter is that the ppl in this country that have little to nothing. They are the ones that are making the economy stronger. The hard workers that are now unemployed because of filthy capitalIsm. The destruction of the American dream is not a result of the government stepping in and keeping businessmen honest so they won't take more than what they earned. This is a big problem with unregulated capitalism and it's why I believe it's an evil that needs to be destroyed. The rich should stop their whining and pay their fair share of taxes. The profits they have made from their companies is not even their money to have. They were not the ones who were on the floor day in and day out trying to make an honest living to feed their families. They are the ones busting their balls and their backs as they suffer through the blood sweat and tears. Now you say in a capitalist society theft should be prosecuted. Wll we can start by prosecuting everyone of the elite CEOs the right to a livable wage so they can sip the finest champagne. It's not their money to hoard it's belongs to the ppl of the united states of American so everyone will be taken care of. So remember that next time you see a mega corporation down size and lay ppl off or you see someones grand mother buying Christmas presents, it's not their money it's ours. It belongs to the middle class and when we have a strong working class our economy almost always flourishes. Social justice to me means we listen to a familiar childhood hero, Robin Hood. Oh and one more thing to add. Remember how I mentioned how bill gates doesn't have to worry about money for the rest of his and his families lives? Well, he is donating all of his profits that he makes from his products. He, like me realizes that it's not his money it belongs to the American ppl. It was us that made him rich in the first place. We gave him all our money and now he is giving it back. Everyone was like bill gates capitalism would be a beautiful thing but they are not therefore capitalism is an evil that must be destroyed. You are completely off the hook. I am going to save your response as an example of the kind of goofball who should be forbidden access to children. Anybody who believes the useless garbage you have herein expressed ought to be made a pariah and cast out of civilization. Your choices are these: Deal by virtue of your labors and their worth on a free market, or deal with your fellow man with a gun. Those are the two choices, and everything you've expressed suggests strongly that your preference is for the latter. Robin Hood was not what you pretend. He stole from royal cronies to return it to the people from whom it had been taxed. He was the first tax-cutter in history, if you believe the legend. Now, I know that's not the sort of robbing hood in which you believe, because you don't believe in property rights either. Go away. Seriously. You have some sort of mental disorder that can be best described as that of a sociopath. Good luck with that. The only thing that separates you from a common criminal is air and opportunity.